Over the years there have been many attempts to use chess as metaphor to describe a number of different realities. Business is one of those realities finding a connection to the dynamics of chess given the use of strategy and tactics. However, what I find more often than not are metaphors clumsily assembled or force-fit into business cases. The result is a mish-mash of facts that are confusing only but for the most astute readers. Business is a generic term to describe a number of processes involved in production of products and services. The process is which these activities occur is neither linear nor as organized as a game of chess. Business is war and there are many events occurring simultaneously and at different speeds. Despite this difference, the stories told by a chess game are similar to those that can be told in business. For example, the idea of sacrificing material to gain compensation in the form of an attack on an opponent or positional advantage is something companies do all the time. There is also the concept of an overloaded piece which can occur if a company expands too quickly and spreads resources over a number of areas. There are also situations where a company may develop a commanding outpost in a product line. 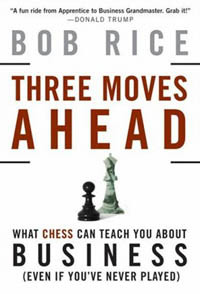 Bob Rice speaks about "strong squares" in his book, "Three Moves Ahead: What Chess Can Teach You About Business." What does all of this mean? When studying for my MBA at Clark Atlanta University, Dr. Robert Lynn in Marketing Strategy told us about Karl von Clausewitz' book "On War." He had told us about a Ries and Trout study that referred to von Clausewitz and his theory on attacking. The idea was that you needed at least a 3:1 advantage in resources to engage in a successful frontal attack. Perhaps one can think of chess game where an attack was contemplated. Do I launch a kingside pawn storm by playing f4, g4 and h4 (or f5, g5 and h5) thus exposing my own castled king to danger. Are my pieces developed to support such an attack? Will I become overextended if my attack peters out?? These are similar questions brand managers and strategists ask when assessing a market. In the 70s there was a lot of discussion about the Japanese incursion into American automobile markets. The Japanese knew they would not be able to clear a profit during their ascent, so they sacrificed profits to gain market share with their energy-efficient and cheaper cars. Through meticulous production and total quality management (TQM) techniques, the quality of these cars improved rapidly and combined with higher gas prices, American consumers began buying the Hondas, the Toyotas and the Datsuns (now Nissan). When the America auto companies reacted with cheap substitutes (Ford Pinto, Chevy Chevette, Chevy Vega), it was too late. The Japanese were able to increase awareness, grab market share and have never looked back. Japanese cars now command a lion's share of the American market and its cars are popular worldwide and are synonymous with quality. Perhaps one of the most important aspects of business is preparation for battle. Prior to an inevitable clash, a manager has to have a plan and perhaps launch pre-emptive tactics to deter competitors from entering a market. This also comes with an understanding of the competitors, their strengths, weaknesses and vulnerabilities. We often enter a tournament game thinking about our opponent and perhaps we've studied their previous games or have encountered them before. Based upon this intelligence, we develop a strategy that will hopefully help us to meet a strategic end. This however is ancillary to the preparation that one has to do on their own set of skills. Despite the gathering of intelligence, one does not go into a tournament without some basic preparation of opening strategies and without developing confidence in one's abilities in tactics and strategies. In addition, there is also the idea of establishing a good frame of mind for battle. Perhaps physical fitness becomes a part of this equation… proper rest, diet and meditative techniques. Likewise, companies have to provide some internal support to motivate their employees and provide them with the environment to compete at a high level. Companies such as Microsoft and Google have become famous for their corporate culture which allow their company to stay motivated and prepared to take on competitors at any time. The parallels between business and chess are striking in a number of obvious ways. So much that there are countless company ads that elevate chess to a loft status due to its perceived connection to making intelligent decisions. Of course there are many other characteristics that make chess an attractive pitch. The idea that chess is a esoteric activity that only a small percentage have mastered gives the impression that one is enlightened. The mistake I often see portrayed in the media is that knowing how to play chess is perceived to be a great accomplishment whether one plays well or not. 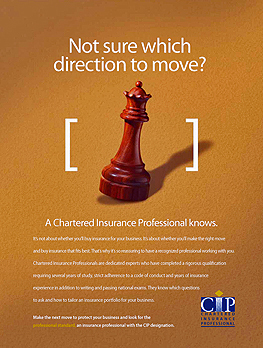 Of course, the purpose of business ads and commercials using chess is to merely express a connection to the prestige of the game and not one's proficiency. Most of the public understands that chess involves foresight and this is a quality businesses would claim to have. Business may indeed mirror chess in that there are different stages captured in realizing a strategic end. That strategic end is none other that "checkmating" the opponent… a cliché that we have heard many times in business and politics. Following are some common connections. 1. Business warfare. Definitely true. Many companies act as predators and use many of the same tactics and strategies seen in chess. Starbuck was reputed to lease a vacant storefront to prevent a competitor from renting the space. The execution is not so much a one-to-one correlation with chess as it is the similar themes that result from a company's actions. 2. Stages of Battle. There is an opening, middlegame and ending in chess. The business cycle has similar stages, but the managers will see to it that the cycle will not meet an end unless it advantageous to the company (i.e., buyout or merger). This is done care carefully gauge the transition between these phases. This is also what separates a chess Grandmaster from everyone else. 3. Planning. With the acceleration of the business cycle and the abundance of information managers face, predicting future trends is becoming much harder to do. It may be more practical to (as the great chess champion Emmanual Lasker stated) to think only one move ahead. This appears more accurate than thinking 20 moves in the wrong direction. Of course, neither option is the most efficient and over time, we would find a company with the right mix of erudition and depth. 4. Time. In a war game like chess, each side is given resources, both material (army) and immaterial (time) in which to accomplish a strategic end. Of course, in business the playing field is not level and companies may enter a market with all types of advantages and disadvantages. However, managing time may be one of the most important factors in business success. Timing of market entry or withdrawal; timing of international expansion, timing of supply chain; timing of cash flows. In business, time is everything. It is the only resource that cannot be replenished. 5. Initiative. There is a classic connection since time is a major factor. However, what also matters is what you do with that time. A company cannot sit on its advantage as if time is unlimited. In chess, some schools of though state that initiative may be more important than material. This means that the company on the initiative has the advantage of determining the direction of the market. There have been many cases where industry leaders have lost the edge because they failed to maintain the initiative. Some reacted too late to market changes and thus lost any advantage that they may have had. A few examples are: Ford, IBM, Microsoft, Kodak and of late, Yahoo! GM Veselin Topalov pitches insurance and financial services. Clearly, chessplayers enjoy the privilege of prestige when telling others they play the royal game. 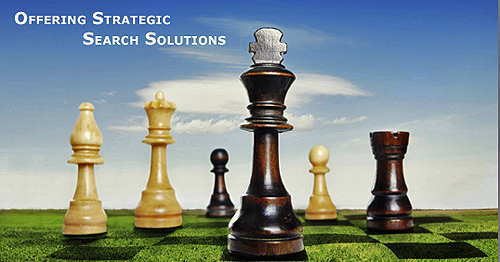 It is no accident that companies requiring strategic insight have recruited chessplayers. There was once an ad recruiting talent in stock trading and commodities brokering. Whether chess abilities translate into tangible business skills could be the subject of an empirical study.